People used to search; advantages of blogging, the major advantages and disadvantages of blogs in business, advantages, and disadvantages of blogs in education, pros & cons of vlogs, advantages of blogging for students, the purpose of blog & blogging, advantages and disadvantages of podcasts, which is best blogging vs social media? In many cases, the blogging starts off as a hobby, but later on, you realized that the blogging has a big business potential in it. Here at PBB, I always talk about making money blogging, since the blogging is one of the greatest ways to make money online. And it is the reason many students after completing the education want to become a full-time blogger. If you see, there are many professional bloggers out who working full time to develop and maintain their blogs and earns more than a typical software engineer. It is only possible when you start a blog on what expertise you have and that you can share with the online audience. You don’t have to work from 9 to 6 but if you work hard consistently, your readers will grow and once you become a successful blogger, you’ll able to earn more money more than a manager, engineer, banker, doctors, lawyer etc. 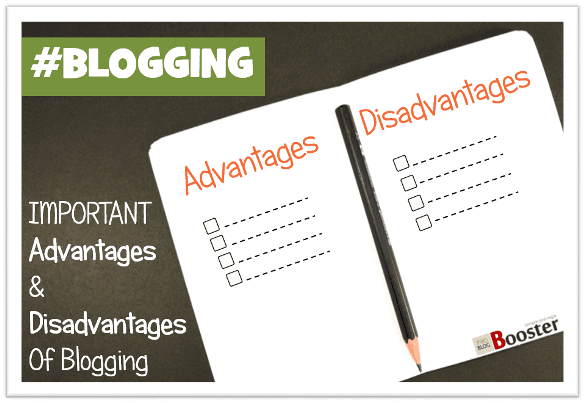 However, what are the benefits and drawbacks of blogging? Can we depend on this profession for an income? Is there any other possible advantage from blogging? These are must-know benefits of having a blog and major points to look before starting a career from a blogger to problogger. There are lots of advantages & disadvantages of full-time blogging, and we have listed some major pros & cons of professional blogging. Review the benefits of blogging and its impact on your business. Check out the pros & cons of full-time blogging and whether it is a good source of income. This article is an attempt to highlight those essential circumstances which one should think about before planning to be a blogger as a part-time or a full-time blogger/problogger or even not. You don't require to have a diploma or degree certification to start blogging. If you have knowledge, writing skill & ability to work hard then nothing can stop you from becoming a successful blogger or a PROBLOGGER. You will be an expert as you write a blog continuously for a longer period of time and always try to search new things related to particular subject every day, you will gain thoroughgoing knowledge about many subjects. Blogging doesn't require a shop/office to start with that you can go there at 10 am & work until 5 pm. Here, you can work from your place (home). Anytime you can wake up, anytime you can go to the washroom, anytime you can start blogging. You can adjust your time & work accordingly. Even you don't need to ask the boss for the leave. Only you & you will be your own boss. Isn't it like a fantasy to you? Whatever we do whether job or business, part-time or full-time; we do it to make money, income for living. Believe me or not, through the blogging you can earn that much to fulfill your requirements, that you probably can't earn from your job. People are making money from $100 to $100,000 per month. This Blogging field has that much potential under it. Only you should have patience & ability to work harder & longer. How much time you give for blogging that much huge you can earn. But that doesn't mean you will start making money from day one of your blogging. It's a slow but steady process. You have to wait until you start earning that much you are getting from your job. Then only you may think to quit your job & start full-time blogging. The blog contains a commenting system that increases interaction with people around the globe. This interaction may result in a friendly relation with equal minded people from all over the world. Now you can start something new work with them. Those may belong to big corporates, and your blog brings them you publish their articles through your blog to reach your audience. This guest blogging will boost your revenue excessively. When you be a full-time blogger & have connections with people worldwide, you may have your special fan followers who follow you regularly on your blog, email subscribers, and social networks. You will be a celebrity in the eyes of your fans. All the businesses today have a blog along with their website whether they are small firm or a large one. They highlight their products & services on the blog for the customers. They promote regular update about their products. Blogging is all about writing, reporting, updating, promoting. So when you start blogging, for you, it will create a way initially, then it becomes a practice and then a habit of writing blog posts. And that will undoubtedly improve your writing skills to a significant level as a blog must not have any single mistake. Every Blog and their blog posts are optimized for the search engines [SEO] so that it indexed quickly and shown in well organized and well-disciplined manner in search ranking - called SERP. That certainly improves your presentation skills. All the blog pages must contain photos, slideshows; moreover, some of the blogs like technically based pages need the video tutorials to teach & convince their readers. The idea behind adding photos & videos in a blog is that the human brain immediately retrieves the language of visualization. So to improve blog you will see an improvement in other skills like photography & videography, creativity. When you sit to write a blog post or a page you should have proper information about the topic you are going to write and publish online. But when you don't have that much relevant information; you walk around over the internet to search & research about other available sources. You will find that there are plenty of sources available. The tendency and desire of finding the required information from available sources may make you a good researcher. That will also lead you to learn some new things every time. A body needs physical exercise to stay fit where the brain needs mental stimulation to stay active. When you choose a blogging as a career, you will get your brain busy all the time to search, research, read, write, edit, post & publish. Blogging provides an exercising workout as well to your brain to stay stronger; which will naturally improve your memory. If you are an Indian & went to America for the job, still, you can write a blog. It's not like that a job or business which require a particular place. Whenever and wherever you go in the world you can blog, you just need to have a laptop/computer & the internet connection and that's all. Blogging has now entered all the fields. There are 'n' no. of blogs around the world to serve in your day-to-day work. E.g., In cooking, plenty of blogs are based on recipes which can answer your daily question what to cook today? Blogging takes more time to settle you in as a blogger & that tries your patience. If you are a full-time blogger and don't have a colleague/co-worker to work with you, you will feel alone. You have to work solely until the time you expand blogging & have someone to work with you. Also, lacks behind to give some time to your family & friends to maintain a proper balance between your professional & social life. The full-time bloggers who are not earning up to the mark may feel frustrated & seem struggling with economic conditions. They totally rely either on their parents or some online jobs, e.g., online form filling. All of us fall sick, unhealthy sometimes as being a human. It is disturbing especially for the bloggers who work alone. They won't get time to write a blog if fallen ill. Only you can request somebody able to write a blog. Conceivably this blog post may turn a motivation for those who want to be a blogger. As I suggested earlier the most important thing to remember is that start blogging along with your job or whatever you are doing. Once you start earning, you can choose BLOGGING field as a full-time career.